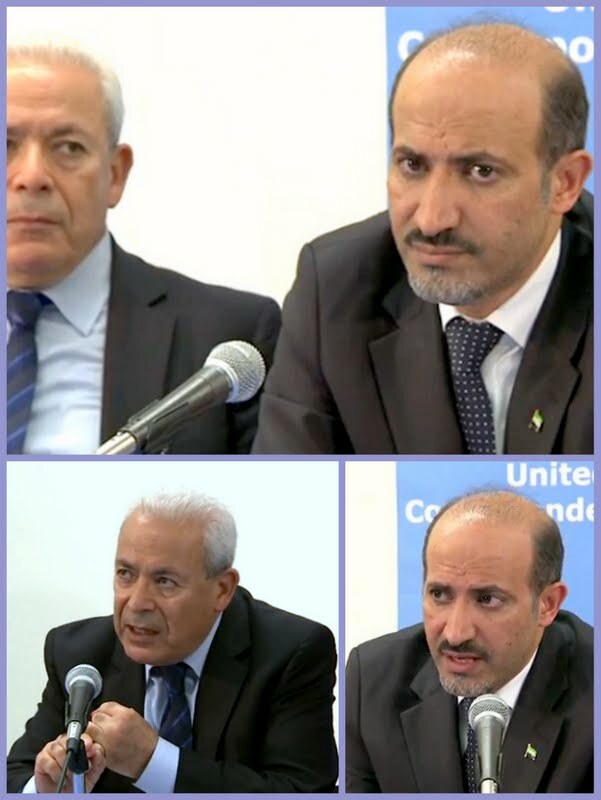 Syrian opposition leaders have told the UN Security Council, which they met for the first time Friday, they are prepared to take part in the Geneva-2 peace conference if it can get President Bashar al-Assad’s commitment to the provisions of Geneva-1. “Ahmad al-Jarba, the president of the National Coalition of the Syrian Revolution and Opposition Forces gave U.S. Secretary of State John Kerry what he needed, that is, an announcement by the opposition that it is ready to attend peace talks,” reported CBS News' Pamela Falk, who presided at their press conference, “and, although there were conditions that they wanted met, they were all within the framework agreed to in Geneva" in June 2012. Falk is president of the UN Correspondents Association, which hosted the Syrian delegates’ press briefing after their informal UN Security Council meeting. The United Kingdom gave the opposition the opportunity to address the Security Council through what are known as “Arria-Formula” consultations. It was an historic opportunity to convey our people’s legitimate aspiration to freedom and democracy. We urged the international community, represented by the Security Council, to assume its responsibility in putting an end to this humanitarian catastrophe. That the Council refers the regime to the International Criminal Court so it can investigate the war crimes committed in our country. We unambiguously urged Russia to stop helping the criminal regime kill our people. We also urged the Member States to lean on Russia and Iran to stop sending weapons and mercenary fighters from Hezbollah, Iraq and Iran to kill our women and children. We supported all regional and international initiatives for a political solution in Syria. We also expressed our readiness to enter into negotiations based on the implementation of the Geneva-1 Declaration and the establishment of a transitional governing body that would exercise full executive power – inclusive of security and military powers. This means Assad is outwith Syria’s future. Our relations with Washington are longstanding, especially as regards our Syrian people’s aspirations. The Secretary’s position was unequivocal in that America will remain supportive of the Syrian people and will not allow the regime to score any victory. At the same time, the Americans were clear in their support of (our) participation in the Geneva-2 negotiations. For our part, we told the Americans the Syrian opposition has been supportive of all international initiatives, including participation in Geneva-2 negotiations – this, in order to fulfill the Syrian people’s aspirations, but not to reach a compromise with the existing regime. We told the Americans: The opposition is not after any post or after sharing government positions. It is after enabling the Syrian people to elect their representatives posthaste. We said as soon as Geneva-2 was proposed, the regime and its allies launched an all-out offensive against rebel positions, using all sorts of heavy weapons, and tapped unlimited support from Russia and Iran as well as from Hezbollah forces and Iranian and Iraqi Shiite militias. This proves the regime has no genuine intention to uphold the Geneva principles. It simply wanted to win the fighting on the ground so it could go to Geneva-2 and formalize its triumph. For Geneva-2 to gel, the negotiations should start with a moratorium on the use of such heavy weapons as warplanes, ballistic missiles, Scuds and chemicals -- weapons meant to kill people en masse. The moratorium on heavy weapons does not mean a ceasefire. Lifting the sieges clamped on cities to starve them of food and medicine. Allowing relief aid to reach all Syrian regions in need across all Syria’s borders. A statement by the regime, which continues to label the opposition as a terrorist organization, that the purpose of the negotiations is to switch to democratic governance based on the people’s will. Press here for a three-part video documentary of the press briefing hosted by the United Nations Correspondents Association. After Khalidiya, is Assad winning the Syria war? Can Egypt harmonize the head and heart?